148 Marlborough is located on the south side of Marlborough, between Clarendon and Dartmouth, with 146 Marlborough to the east and 315 Dartmouth to the west. 148 Marlborough was built in 1872-1873 by John Fisher Farrington, a carpenter and builder, for speculative sale, one of five contiguous houses (140-142-144-146-148 Marlborough). He had built three contiguous houses in 1871-1872 at 132-134-136 Marlborough. 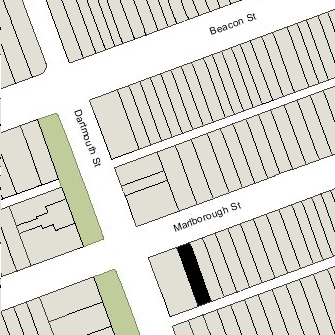 138 Marlborough was a vacant lot until 1891. Click here for an index to the deeds for 148 Marlborough. The November 2, 1872, deed from Louisa Hunnewell to John Farrington included a requirement that no house built at 148 Marlborough could be higher or deeper than the Hunnewells’ house at 315 Dartmouth. On September 23, 1873, Louisa Hunnewell and John Farrington entered into an agreement confirming that the house he had built at 148 Marlborough conformed with the earlier deed’s restrictions and that any future house built on the lot would be of the same dimensions unless 315 Dartmouth were expanded, in which case the dimensions of the house at 148 Marlborough also could be increased but must be within the expanded dimensions of 315 Dartmouth. On October 15, 1873, 148 Marlborough was purchased from John Farrington by Eleazer Crocker Sherman, a widower. He previously had lived at the Tremont House hotel. A former flour and grain dealer in Plymouth, he was president of the National Bank of the Commonwealth. During the 1877-1878 winter season, Eleazer Sherman was living elsewhere and 148 Marlborough was the home of chemical manufacturer George William Webster Dove and his wife, Susan Cotter (Glidden) Dove. Their primary residence was in Andover. In July of 1878, Eleazer Sherman remarried, to Mary Louisa (Perkins) Thayer, the widow of Edmund D. Thayer. After their marriage, they lived at 148 Marlborough. Eleazer Sherman died in February of 1881. Mary Sherman continued to live at 148 Marlborough during the 1888-1889 winter season, but moved thereafter to Cambridge. On February 13, 1889, and March 1, 1889, 148 Marlborough was acquired from Mary Sherman and from Eleazer Sherman’s estate by stockbroker Stanley Cunningham. He and his wife, Mary Ann (Crehore) Cunningham, made it their home. They previously had lived at 167 Newbury. On October 2, 1889, Stanley Cunningham transferred the property into his wife’s name. 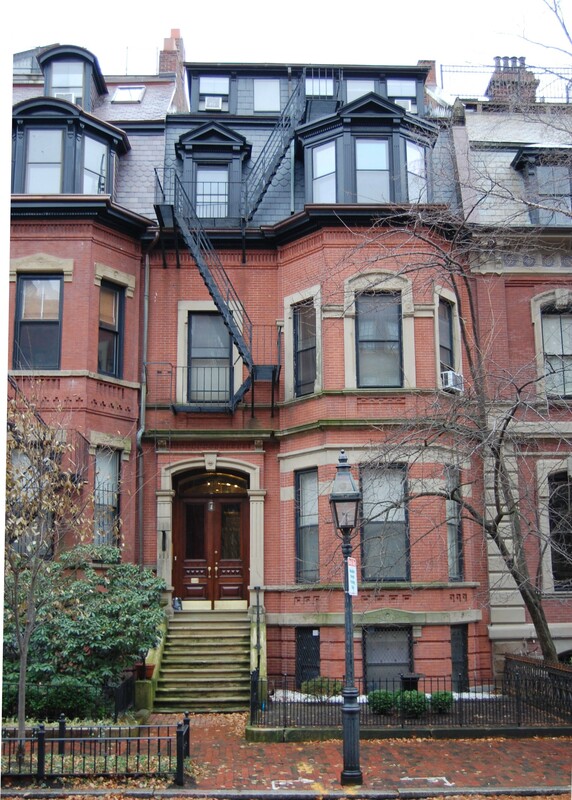 They continued to live at 148 Marlborough during the 1894-1895 season, but moved thereafter to Brookline. On November 25, 1895, 148 Marlborough was acquired from Mary Cunningam by Dr. Franklin Dexter. He and his wife, Jane Appleton (Dwight) Dexter, made it their home. They previously had lived at 363 Beacon. Franklin Dexter was a physician and professor at Harvard Medical School. On March 20, 1897, he transferred the property into his wife’s name. In October of 1902, they purchased 247 Marlborough. They continued to live at 148 Marlborough during the 1902-1903 winter season, and then moved to 247 Marlborough. 148 Marlborough was not listed in the 1904 Blue Book. On October 29, 1903, 148 Marlborough was purchased from Jane Dexter by Thomas Jefferson Coolidge, who owned and lived at 315 Dartmouth. T. Jefferson Coolidge was the former treasurer of the Boott Mills in Lawrence, and was an investor in textile mills, banks, and railroads. In 1890, he had joined his son, Thomas Jefferson Coolidge, Jr., in founding the Old Colony Trust Company. He served as Ambassador to France in 1892 and 1893. By the 1905-1905 winter season, 148 Marlborough was the home of Rear Admiral Francis Tiffany Bowles and his wife, Adelaide Hay (Savage) Bowles. In 1903, he had retired from the Navy and become president of the Fore River Shipping Corporation. Their son and daughter, Thomas Savage Bowles and Catherine Hay Bowles, lived with them. They also maintained a home in Barnstable. On May 13, 1908, Adelaide Bowles purchased 148 Marlborough from T. Jefferson Coolidge. Thomas Bowles died in August of 1910 while a student at Harvard. Catherine Bowles married in October of 1915 to Alfred Putnam Lowell, a lawyer. After their marriage, they lived at 56 Brimmer. Admiral Bowles died in August of 1927. 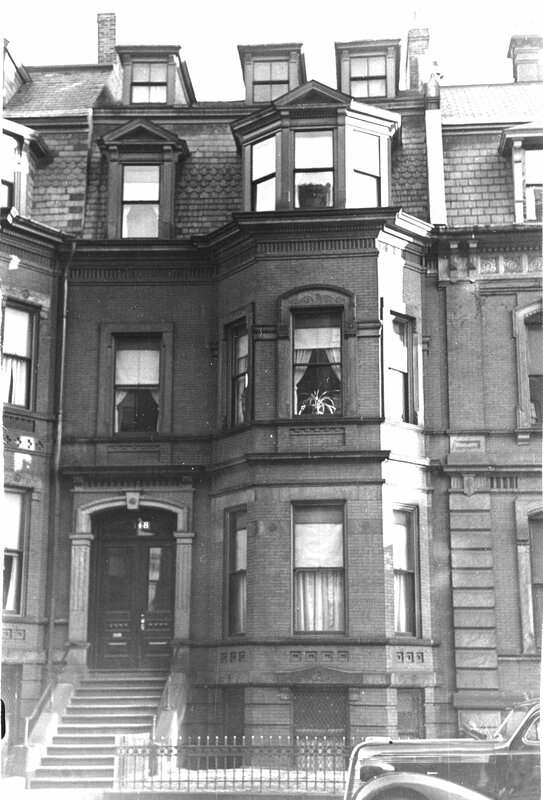 Adelaide Bowles continued to live at 148 Marlborough until her death in January of 1949. On July 1, 1949, 148 Marlborough was acquired from Adelaide Bowles’s estate by real estate dealer Thomas J. Diab. In June of 1949, prior to taking title to the property, Thomas Diab applied for (and subsequently received) permission to convert the property from a single-family dwelling into nine apartments. As part of this remodeling, the top floor was expanded to accommodate two apartments, eliminating the three original dormers. Plans for the remodeling, designed by architect Clark F. Merrick, are included in the City of Boston Blueprints Collection in the Boston Public Library’s Arts Department (reference BIN R-99). On July 14, 1950, 148 Marlborough was acquired from Thomas J. Diab by Antoon Tamer Homsy and his wife, Wardeh J. (Najjar) Homsy, of Quincy. On January 17, 1955, they transferred the property to their son, Dimitri Homsy, as trustee for the benefit of their five children: Dimitri Homsy; Jamileh Homsy DeGuida, wife of Pascal DeGuida; Leila Homsy; Yvonne Homsy; and John Homsy. Antoon Homsy died in February of 1959. On August 1, 1978, Dimitri Homsy transferred the property to his brother, John Homsy, as trustee if the Chatham Trust. 148 Marlborough remained an apartment building in 2016.